Here is a great introduction to the remarkable mind of Shigeo Shingo, indisputably one of the great forces in manufacturing. In this soft cover book, Dr. Shingo describes his approach to manufacturing improvements, developed and refined over the course of a brilliant career. He called it the Scientific Thinking Mechanism (STM). 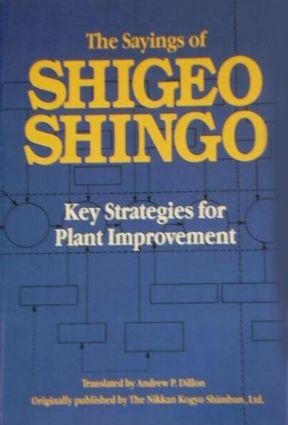 The Sayings of Shigeo Shingo leads you through the five stages of STM, with appropriate examples taken from notes Dr. Shingo collected during his consulting trips to American and Japanese plants. It shows how, in many cases, the most brilliant ideas are often so simple they're overlooked. Or they're dismissed because they seem ridiculous: - A Japanese plant, after first rejecting the idea as too silly, finds that unhulled rice is ideal for smoothing the rough surfaces on pressure-formed ebonite switches - Granville-Phillips, in Boulder, Colorado, reduced defects to zero in one process after Dr. Shingo suggested illuminating circuit boards from below to reduce errors involved in the insertion of diodes and resistors The Sayings of Shigeo Shingo is must reading for plant managers and engineers. It formalizes the powerful and creative way of thinking that Shingo himself used time and again to overcome problems that seemed virtually insurmountable.